Sports Rendezvous: Nigeria Vs Iceland Preview: Bruised Super Eagles looking to answer several questions in crucial Group D clash. Nigeria Vs Iceland Preview: Bruised Super Eagles looking to answer several questions in crucial Group D clash. 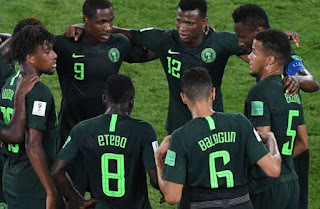 Super Eagles disappointing 2-0 loss to Croatia in their opening game of the 2018 FIFA World Cup have been followed by debates on some questionable decisions of Gernot Rohr. Before the loss in Kaliningrad, there have been little criticism of Rohr, largely because the Super Eagles have shown remarkable improvement under him while the successful qualification process for the 2018 FIFA World Cup have given the benefit of doubt. He caught a hint of how critical Nigerian football enthusiasts can be when the Super Eagles suffered a shocking 2-0 home loss to South Africa in a 2019 Africa Cup of Nations (AFCON) qualifiers in June 2017.